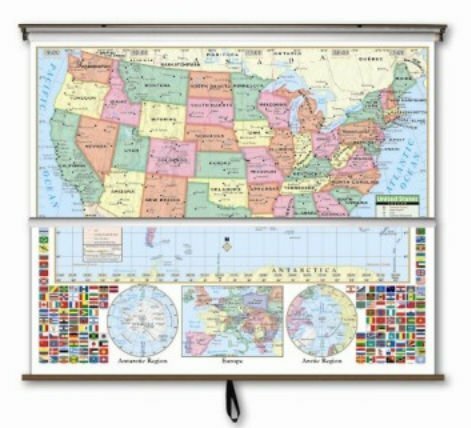 Primary Wall Map Combo - U.S. / World Backing: On Roller by Universal Map at Old Mill Middle North. MPN: 24146. Hurry! Limited time offer. Offer valid only while supplies last. 24146 Backing: Without Backboard Features: -Includes one U.S. and one world map. -Mounting hardware not included. -Choice On roller. -Laminated. View More In Social Studies Materials. 24146 Backing: Without Backboard Features: -Includes one U.S. and one world map. -Mounting hardware not included. -Choice On roller. -Laminated. Style: -Traditional/Classroom / Educational/Political. Colors: -Traditional Blue. Laminated: -Yes. Multiple Maps: -Yes. Roll-Down: -Yes. Dry-Erase: -Yes. Product Type: -World Maps/U.S. Maps/Political Maps. Dimensions: Overall Height - Top to Bottom: -54 Inches. Overall Width - Side to Side: -64 Inches. Overall Product Weight: -10 Pounds. If you have any questions about this product by Universal Map, contact us by completing and submitting the form below. If you are looking for a specif part number, please include it with your message.